Posted on Sat, May 14, 2011 : 1:43 p.m.
From left: Girl Scout Troop 40580 leader Debbie Koch, daughter Kourtney Koch, a 9th grader, Brianna McAlister, a 9th grader, troop leader Cynthia Hodges and her daughter Jane, a 9th grader, kneel next to raised beds they installed to plant a garden behind Dexter High School in Dexter, Mich. on May 14, 2011. When Dexter Township resident Kevin Sullivan was battling head and neck cancer from 2008 to 2010, he maintained a healthy vegan diet. Although he died of cancer in September of 2010, he and his wife, Lori Sullivan, credit his healthy diet with prolonging his life. As a tribute to Kevin Sullivan, a garden was installed last week behind Dexter High School, adjacent to the school greenhouse and foods lab. The mission of the Memorial Learning Garden is to provide high school students with a connection to healthy food, food self-reliance and career pathways, and to celebrate Dexter's agricultural heritage. In 1988, the Sullivans moved to an old farmhouse that they renovated in Dexter Township. They garden about 3/4 of an acre and do a lot of cooking, canning and freezing. "When Kevin was alive, we would invite up to 40 people over through the winter months for soup," said Lori Sullivan. "Food has always been an important part of our lives." After Kevin's death, Lori Sullivan decided that with their son Austin graduating from Dexter High School (now a freshman at Bowling Green State University) and their daughter Madeleine at Mill Creek Middle School, the high school would be a good location for the garden. She also believes that it's during high school that students begin to understand the connection between what they eat and how it affects their bodies. On Saturday, May 7, close to 50 students, teachers, and friends of the Sullivan family helped install the garden, which was designed by retired Dexter landscape architect Sandy Hansen. Among the participants was Girl Scout Troop 40580, including scout Jane Hodges and her mom, Cynthia Hodges. 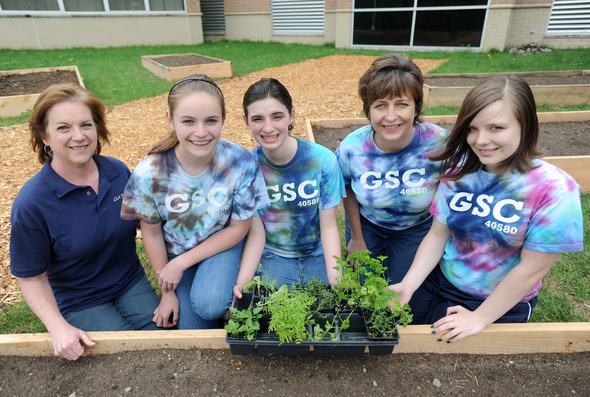 "These Senior scouts, who are all ninth-graders at Dexter High School, heard about the garden and decided to adopt it as their 'Take Action' project to culminate their yearlong journey," said Cynthia Hodges, who explained that the troop is taking part in a Girl Scout Leadership Journey called "Sow What" that includes identifying and digging into a food or land issue. "They are hoping that one day, vegetables in the garden can be used to make salads to serve for lunch in the high school cafeteria." Six raised garden beds were installed, and Lori Sullivan is asking for donations of tomato, onion, green pepper, hot pepper. garlic, rhubarb and strawberry plants. The goal is for the high school's food and nutrition science classes to make salsa and sauce once the plants are ready to be harvested. The garden also needs volunteers through the summer as well as tools, hoses and organic fertilizer. There will be a fundraiser dinner at Zingerman's Roadhouse on Friday, June 10 run by Chef Alex Young, a Dexter parent, who will offer a menu showcasing local farms and foods. Other garden projects include the upcoming Dexter High School Senior picnic, when seniors will plant watermelon and cantaloupe seeds, and then in the fall, freshman will be served those melons at orientation. There are also plans for fine arts teacher Autumn Campbell and her students to make ceramic globes that will be inscribed with words like Hope and Believe, and they will be glazed and placed on directional signposts in the garden. Lori Sullivan said she appreciates all the interest in the garden. "Kevin would have liked that kind of enthusiasm," she said. "The garden is a way that I feel Kevin still lives on." Sun, May 15, 2011 : 5:19 p.m. Thanks for sharing this story with the cheerful faces of the Girl Scout Troop. Healthy eating makes the connection between food and spirituality. Man has no existence, either in good health or in ill health, without connection to a source of food. When we look at the seeds that they have planted at the Dexter High School, the power of creation becomes simply evident. The seeds derive nutrition for their growth from the same soil and manufacture plant substances using the same solar energy. The process known as Photosynthesis is a very creative mechanism and we recognize it when we eat and taste what we grow and recognize the difference between strawberries and bellpeppers which have varying degrees of sweetness and flavors. We get different nutrients that constitutes what we call as healthy eating. Eating is the simplest and direct manner to formulate our spiritual connection with our Creator.